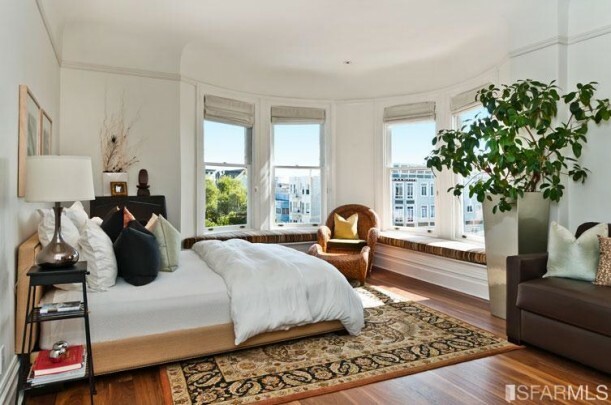 This stunning Victorian in San Francisco was built in 1902 and is a real show-stopper. Its original period details have been preserved, but the interiors were updated with some modern finishes and contemporary design. 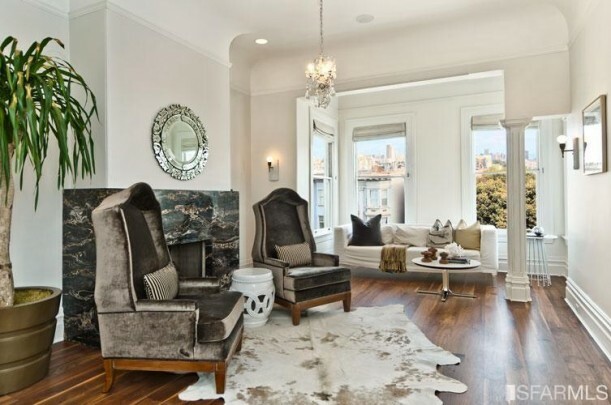 It’s on the market for $3.8 million, so take a look and see what you think! The floors are walnut with radiant heat. The 12′ coved ceilings feature the original intricate detailed moldings. 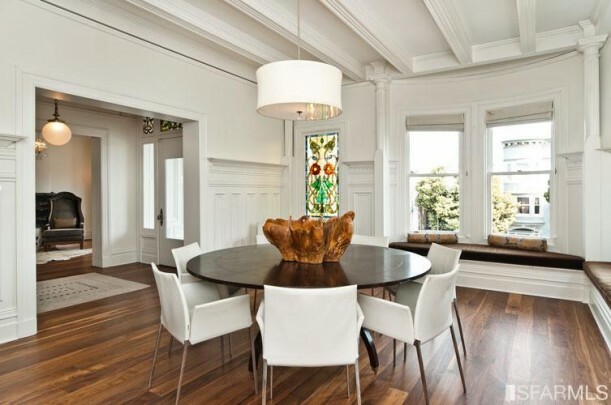 The woodwork, stained glass, built-ins, and window seats in this dining room are amazing, but it’s a lot of white. Wish we could see what it looked like originally, before the wood was painted over. “The light-filled Arclinea gourmet kitchen is finished with Carrara marble and has an impressive wrap-around counter and custom cabinetry. The two-tier island welcomes guests with comfortable bar seating and tempts chefs with a Wolf cooktop on the other. 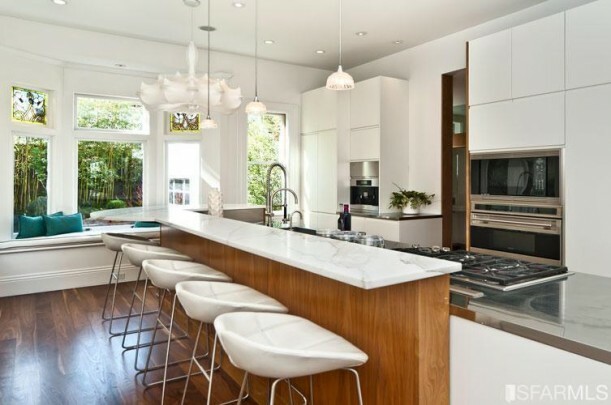 A tall bank of white custom cabinets provides abundant storage and walnut veneer provides warmth. 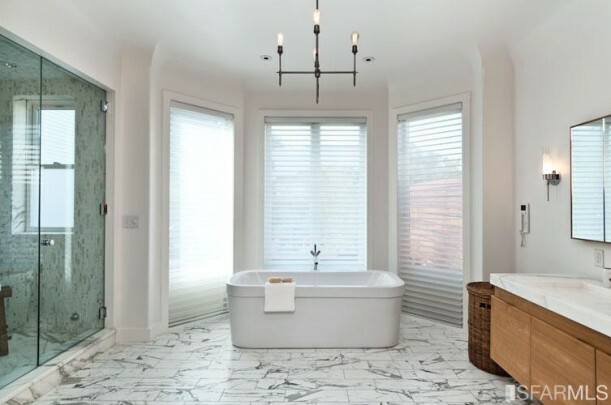 The remodeled master bath has a soaking tub and steam shower with Philippe Starck fixtures. 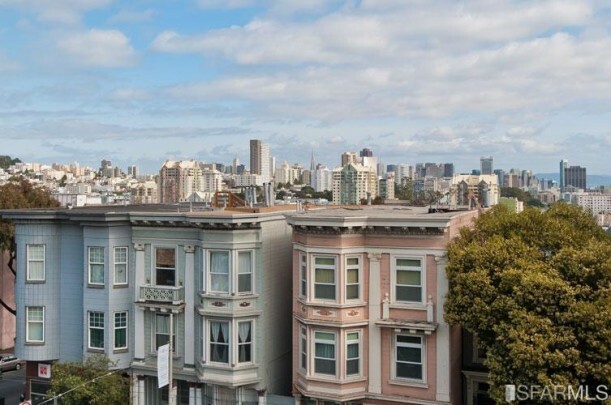 The house is close to Alamo Square and within a short walk to the Panhandle and Golden Gate Park. I think, unfortunately, that all of that character = detail is not synonymous with affordable. This house wasn’t cheap when it was built either, I don’t think. It is a very plain Painted Lady. The Victorians weren’t afraid of Colour. I absolutely love the exterior but the inside seems very cold with all the modern changes. Yes, I think it was a mistake to paint out all those wonderful original moldings & wood details. What could have been a charming & appealing interior has ended up looking rather bland and washed out. Pity. love the exterior but i’m a black and white type of gal. wish the interiors weren’t so neutral but i’d live there. very clean looking. gave me lots of ideas for moldings, etc. outside a killer. I dont care so much for the furnishings, but I think that the next owner will have no problem with adding pieces closer to the style of the home. Except the kitchen it may take a little more work. Interesting, but way too white and way too stark. Also I can’t quite make out what is going on with the pillar in the 5th picture down. it looks sort of chopped off. Either the angle for the picture is strange, or something odd is going on there — perhaps rooms were reconfigured? Noticed that and it isn’t a pillar shape from any where else in the house I think it’s a ring in. Im pleasantly surprised! I was expecting to see the interior stripped of any hint of Victorian. I actually think they did a good job of mixing a modern aesthetic in with the historic architecture. Love the juxtaposition of the fine old woodwork with the clean lined furniture. Color me surprised! The outside does not match the inside. Beautiful. I don’t care for Victorian houses, so I thought their modern take was very refreshing. I loved that they painted all the wood. Pure white everything does not accentuate the beauty of the victorian style of the interior of this home. Love it! I love the modern look tucked into the Victorian home. I would not be happy living among Victorian furnishings but I still love the home itself. This is a perfect compromise! 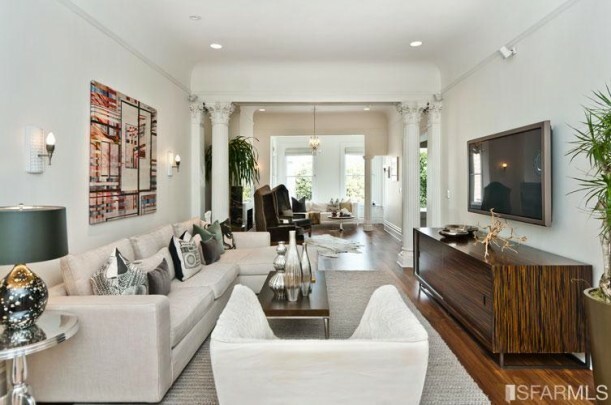 I like the way they minimized the Victorianism with white paint and modern styling. Most period victorians remind me of dark, depressing funeral parlors. I really hate it when people take lovely old homes and rip out the antique finishings and put in modern stuff (like the fireplace in that house). It’s fine if you like a modern/contemporary style…but there are LOTS of brand new houses where you can live out your modern/contemporary dreams. Please don’t take a beautiful old home like that and remove a one-of-a-kind vintage fixture that can never be replaced. If you must be modern in an old house, at least keep it to the furniture and things that you take with you when you move. That beautiful Victorian has forever lost it’s original fireplace…all because one owner (who probably owned the place for less than 10 years) preferred a more modern style. I agree! I feel that today’s version of contemporary/modern will be dated in 10-20 years and the owners will have to rip it all out and start over again. What’s wrong with traditional style, guys? I agree. This house is beautiful and detailed on the outside and then they went and ruined it with the overly stark and modern inside. What’s left is just a jarring mismatch of exterior and interior. If they liked modern, why not just find a new modern style house? Im surpised the owners even liked the outside enough to buy the house since Victorian is clearly not their style. As far as future owners, the mismatch really limits potetial buyers. I see lots of people being disappointed in the interior and turned off by the amount of work it would take to restore it. I’d keep looking for one that wouldn’t require a total rehaul. What a waste. No country French here! Way, way too modern for the beautiful external view. Yep, the interior of the Normandy home was such a disappointment. I don’t mind if folks push the limit a bit with the interior but both this house and the Normandy house were pushed a bit too far for my taste. I live in an old Victorian, and a lot of the wood was painted over before we moved in. We’ve tried stripping some of it, but it really didn’t work. But to tell the truth, a lot of the Victorians in my neighborhood with all the dark wood are a little dreary. That being said, I think I would have liked it better if they had mixed old and new a bit instead of just going all new and modern. I find that more interesting. I did a pretty traditional kitchen in my house because going completely mod felt out of place. I would have liked a more interesting exterior, and not just all white. If they had done a very colorful, traditional exterior, it would have made the whole thing more interesting. If I bought this house, I would probably leave the modern finishes, and add some vintage Victorian lighting or other elements that would pay homage to the house’s origins. I’ve done a bit of the opposite in my house. For example, in one room, we have an ornate plaster ceiling medallion with a very modern fixture. I think it is a lovely house, and I would not turn it down! I was surprised that I liked most of what was done to the house. Only the bathroom looked a little out of place but overall I thought it was nice. I’m with Chris on this one. Particularly hate the kitchen. Don’t like mid-century modern in a Victorian – there are plenty of ranchers out there for those who want to indulge their preference for it. While I can understand the need for opening up and brightening a Victorian, and most of us don’t want to live with Victorian furniture and bric-a-brac, I’d like to see a more vintage or traditional mix of furniture, as if acquired by different generations. And all of that white makes the fantastic architectural details disappear, as well as making it very cold. You can freshen the old without making it ghastly. This is what I call remuddled. With all the high tech moving into the city they will likely get their price, but they truly ruined much of the value of this home. Making the choice to paint over *all* of the wood destroyed the character, as did the fireplace removal, much of the molding, and light fixtures. Stripping the wood no matter how well done cannot replicate the patina. While there are not any ranch choices for the trendy hipsters that want to live in the city, there are lots of loft spaces, etc that would work with this mid-century modern Ikea catalog look. Seeing these types of remuddles makes me sad. Especially so because I’m local, and I hate seeing local history destroyed. There are ways to lighten/update and still keep the character. I’m not sure I could live there without gutting the kitchen, repainting, and hitting up the salvage yard for a new fireplace and fixtures. Love everything but the kitchen. You’re Welcome! Can I just say that I am in love with the exterior. It is so gorgeous! As for the rest of the house, my least favorite style is contemporary. I have always found it not very nice so I’m not a fan of the interior. 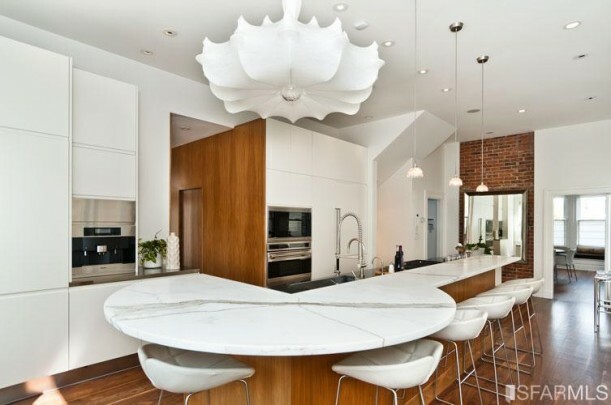 The white is too much for me and that kitchen doesn’t go well with the rest of the house. I think the inside would have been better had the homeowners mixed dark wood elements with white. That way at least you could have some of both. Also the kitchen would have been better had the style fit the Victorian period. Altogether this home isn’t too bad, but could use some changes. Let’s hope the next homeowners will bring out the original style. I agree the decor and remodel is to modern . The bathroom is boring and the kitchen does not compliment the house. Oh and what the original fireplace would of looked like if kept and protected! Hi, I’m new to your blog. I don’t mind all the white, but I think the kitchen and master bath were a HUGE MISS!!! When you have a moment, please pop over and check out my recent post, I think you’ll like it! They could have modernized it without “modernizing” it. So many great products out there on the market that would have made this house look a bit more period. It’s possible that the house was in terrible shape when bought. I just don’t get the finished product. Yes, the finishes are beautiful. Just not for this style of house. And yes, please bring in some color! The pictures tend to make everything looked washed out. I love the details on the outside. More color would have made them pop. I almost didn’t view the photos when I saw the Victorian exterior–it is SO not my style! But I thought that this was so wonderfully decorated inside. I absolutely would have painted over all the fusty old woodwork & would not apologize for it. 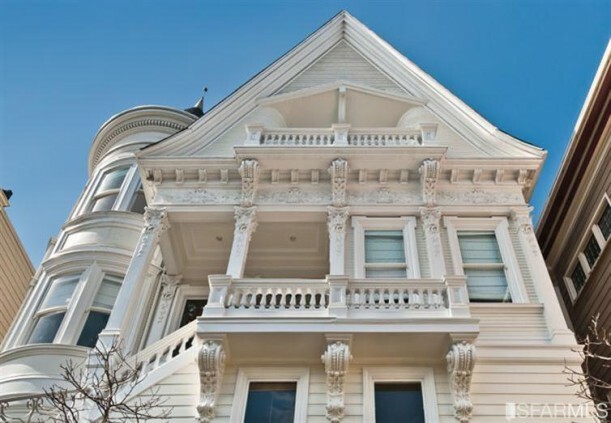 Victorian homes are beautiful on the outside, but hideous on the inside–why be forced to decorate like Grandma Munster just because you live in San Francisco? I have never liked that fact that if I lived in Boston I’d be forced to live in a colonial home. Or in Arizona I’d be forced into another sort of home, with a howling metal wolf on the wall. Or how about all high-end tract homes that force you into Mediterranean or Old World (like the home I’m currently in). Yup, I know I don’t have to buy the house but the area I live in my choices are traditional, Old World or Mediterranean–to get into an area with mixed-style housing would mean a terrible commute. Tract home builders have ruined the American landscape IMHO. I wish there were more neighborhoods that had a bungalow next door to a Tudor, next to a Prairie Style, etc. Hi Julia – I love the outside just think of the exercise climbing those stairs it won’t cost a thing. Love stained glass. Don’t like walnut stain something lighter would have been better which would allow for more colour to be added everywhere else in the house. After all that if I could I would love to live here. Thank you for sharing. Regards Esther from Sydney. PS I am obsessed with stained glass but can’t afford it …got the next best thing a few pieces from The Met Store (Tiffany replicas). I love it. 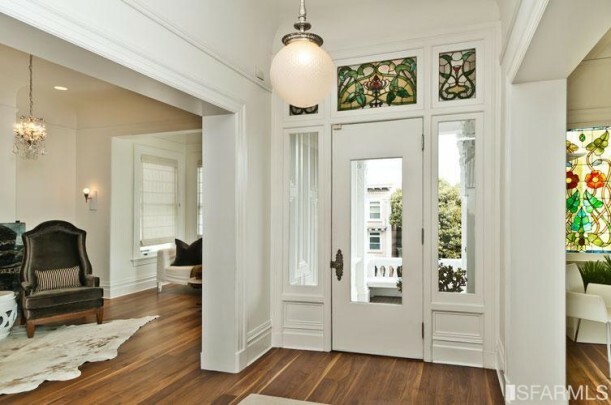 I do not care for traditional Victorian colors, but I also like to see original woodwork preserved. I think the stark white walls against the original stain of the woodwork would have been very pretty, too. The woodwork would have popped off the white. They could also use some art. Brilliant house but way to much White ..need some colour! Okay, this is totally off the subject but I went and saw The Lucky One this weekend and you MUST SEE THIS MOVIE!!!! The old farm house had me from the first shot and it had alot of screened doors and wood floors and porches and oh my! You GOT to go see it. The wood scenery is absolutely stunning and Zac Efron ain’t too shabby either! Oh, really? Thanks for the heads-up, Beverly! I personally like painted woodwork in any home. However, the kitchen and bathroom were ugly, in my opinion, and did not fit the style of the house. white walls. I could happily live in that bedroom. And meant to write plants instead of pants. Ack! Wow, it is amazing how polarizing this house is! I am in the thumbs down camp, but it is quite interesting to read arguments both for and against. Julia, you certainly found a very interesting house to share with us, thanks! I don’t object to all the painted trim, but that modern fireplace in the loving room is awful. Don’t like the kitchen either. Doesn’t have any flavor of the house and the upper cabinets should at least go to the ceiling. It would have been lovely if they would have kept the home true Victorian. The outside architecture speaks volumes of that era. Unfortunatley, it is all TOO much white and modern. I would think.. the reason one would buy a Victorian home is.. because.. you love the era. So why buy a Victorian home and make it modern?? Not much sense to me. Very cool! You see this a lot in Richmond, VA as well…in the historic Fan district. Not everyone loves historic charm, so some younger folks like to trick out their old homes with modern fixtures and furniture. 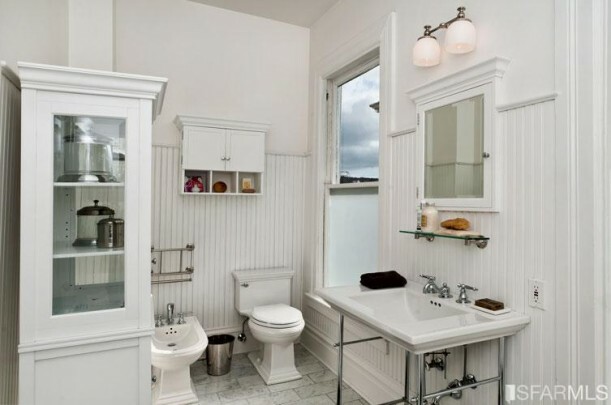 Love the bathroom though…could have used that photo as inspiration for my own bathroom renovation I’m working on! Beautiful renovation but way too much white! I wish they hadn’t painted over the original wood – the house is cozy but the white is too antiseptic looking. Well, when I first looked at the pictures, I was jarred by the interior style versus the exterior and was off-put by it, especially if I was looking for a Victorian style home. However, if you strip the furnishings out and just had the architecture left of the home then I could appreciate all the trim work painted white since I’m not a dark wood type of girl. However, the kitchen and master bath designs are just total misses. Even if the exterior were mid-century modern, I wouldn’t care for the style of the kitchen. For that kind of money, I guess the expectation is that if you can afford the house, you could afford to re-model? Hmmm. I don’t really care for the kitchen or the bathroom either. 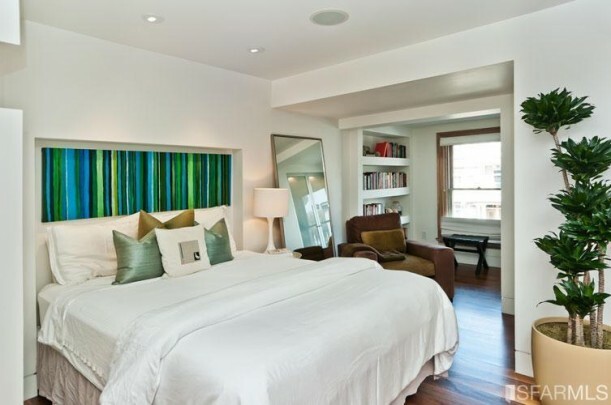 I don’t feel that updating with MCM furnishings and fixtures suits this style of home either. I don’t mind the painted woodwork, although I would be more inclined to leave some of the original woodwork preserved. There is just too much white, which makes it look stark and cold. I understand–sometimes–toning down the Victorian details in a house if that’s not really your style. But why on earth would they buy THIS house if you don’t like High Victorian? There are plenty of Plain Jane Victorians, and even craftsmans and other choices, in San Francisco. This house is beautiful, over the top, uber Victorian and to have painted over every detail is a crime. Modern and Victorian = Fabulous!!! Beautiful house. I for one do NOT understand buying this kind of house and doing a Modern interior. What the divil is the POINT?! I can’t stand modern, myself. The front of the house is reminiscent of the house in Mrs. Doubtfire, only the rounded rooms are on the left, not the right. Overall lovely home! I wouldn’t buy as it is unless I had a billion dollars to do a redo. IT is ruined with the modern look it was given. Hate the fireplace, black marble look. I’d rip it out in a heartbeat. Return the house to the original look with the marvelous woodwork it would have had in a dark grain. Why did they buy this house, location? A Victorian is obviously not their preferred style, I agree. The bones are there though. Hoping someone can restore it appropriately.